The Best of Teacher Entrepreneurs II: Language Arts Lesson - "Interactive Writing Notebooks WRITING CCSS for 3rd-6th Grade"
Language Arts Lesson - "Interactive Writing Notebooks WRITING CCSS for 3rd-6th Grade"
Core Writing Standards to my fourth graders. 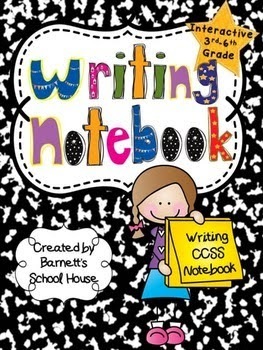 This is an interactive Writing Notebook that is aligned to the 3rd, 4th, 5th and 6th grade Common Core Writing Standards. I use this notebook at the end of each year to ensure that my students have a working folder as evidence.